Together with her tough and trusted assistants, Lizzy is tracking down a list of Sacramento's worst offenders and dealing out the payback they deserve. But she may be lethally outmatched by a new criminal, a murderer the papers have dubbed the Sacramento Strangler. This ritualistic serial killer is dropping corpses and cryptic clues at a shocking rate - and he's growing bolder and bloodier the longer he's at large. In the suspenseful finale to the Lizzy Gardner series, bestselling author T.R. Ragan's gutsy heroine lashes out against the relentless onslaught of evil as she desperately fights to hang on to her own humanity. ©2015 T. R. Ragan. (P)2015 Brilliance Audio, all rights reserved. This was/is such a good series but I didn't get the feeling of completion. I know the description says this book is the finale BUT I still got the feeling that there was unfinished business. This story has an awful lit going on, two mysteries being solved and personal inner turmoil with all the main characters. Lizzie gives up the PI business and I can't say why without giving away something but it looks like someone from her inner circle will be taking it over. I also just don't see her just walking away. All I can say is if you like this series so far then this one will not disappoint you. I would not read it as a stand alone because there is a lot of background that fill out the characters. The best, and final, novel in a wonderful series!! 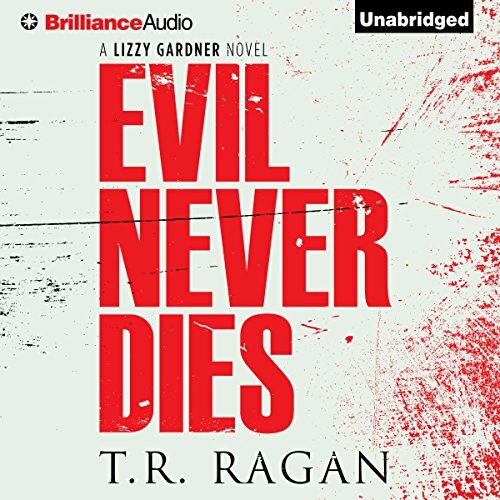 T. R. Raran ended the Lizzy Gardner series with Evil Never Dies which is the best book in an excellent series. At least she indicated in her end notes in the Kindle version that this is the last book in the series unless she changes her mind. As with other books in the Lizzy Gardner series this novel is set in Sacramento and the cases include serial murders. Evil Never Dies has more complexity than other books in the series. I HIGHLY RECOMMEND Evil Never Dies and all six novels in the Lizzy Gardner series. Narrator Kate Rudd is, as always, outstanding. Evil never stops, even in the end! I will start this review out with a notice to all readers, I will include spoilers from the previous book in this review, but not for this book. You have been warned. Lizzy Gardner has just taken a devastating blow with the loss of her fiance, Special Agent Jared Shane. Her way of coping with the loss is to become a vigilante along with her assistants Haley and Katalie. Word has spread on the street about Lizzy's “undercover ops”, and Detective Chase isn't happy. The question of the day is, will Lizzy straighten up before she crosses the line? Kate Rudd delivered another great performance! I am sad that this is the end of this series, but I hope to come across Kate again in other audio books. Good luck Kate! The morning commute is a nightmare and instead of 25 minutes it takes 2 hours to drive to work. Thank you TR Ragan for great listening, preventing me from passing out behind the wheel. A great book as usual. Keep up the good work. Let's hope there is another book in the series. I have enjoyed the series and the intelligent group of women working as private eyes to solve mysteries. But, the last two books have left me cold. I didn't enjoy the theme especially in this book. The last Lizzie Gardner book. Sometimes a book ends and you say what! But not with this one. It ended perfectly. If you loved the series you’ll need tissues. Hard not to shed a tear to this finale. Loved the series and the characters. Sad to see it end.